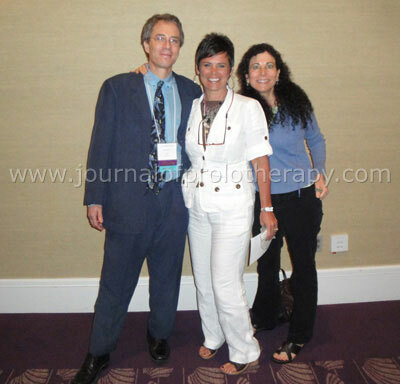 At the American Osteopathic Association of Prolotherapy Integrative Pain Management (AOAPIPM) meeting, April 7th-10th, in Naples, Florida, Donna Alderman, DO introduced the topic of Stem Cell Prolotherapy. The technique she utilizes was developed with the help of Robert W. Alexander, MD and involves the use of autologous adipose tissue as a source of adult progenitor (stem) cells for use in Prolotherapy. In this issue, both Drs. Alderman and Alexander give comprehensive details into the research and protocol of this type of Stem Cell Prolotherapy. You might say why not call it “stem cell therapy?” All one has to do is search Google to see that there is a lot of confusion as to what constitutes stem cell therapy. Some doctors are taking concentrated bone marrow or adipose tissue stem cells and injecting them intravenously and claiming to help or cure conditions including heart disease, Parkinson’s and a myriad of others. Sometimes we need to remember that the dictionary definition of Prolotherapy is “the rehabilitation of an incompetent structure, such as a ligament and tendon, by the induced proliferation of cells.”1 In other words, any injection technique that stimulates healing via the proliferation of cells is Prolotherapy. Thus, PRP is not a procedure, the procedure is Prolotherapy. It is technically not correct to say “I am doing PRP on you.” Would you say to someone “I am doing dextrose on you?” The procedure is Prolotherapy, so the better terminology for platelet rich plasma is PRPP, or Platelet Rich Plasma Prolotherapy. There is dextrose Prolotherapy, sodium morrhuate Prolotherapy, hormone Prolotherapy (with human growth hormone or testosterone), PRPP, and now lipoaspirate Prolotherapy, which is a type of Stem Cell Prolotherapy. Stem Cell Prolotherapy has quite a history in veterinary medicine. In this issue, we provide an extensive interview with Sherman Canapp, DVM, one of the innovators in regenerative medicine in animals. He is one of the most experienced veterinarians using Stem Cell Prolotherapy, which he calls stem cell therapy, to regenerate injured structures. He uses the Vet-Stem regenerative cell therapy system at the Veterinarian Orthopedic Sports Medicine group in Annapolis, Maryland. On the website www.vetstem.com they noted that 62% of dogs with osteoarthritis discontinue or decrease the use of NSAIDs after stem cell therapy (Prolotherapy). They also note that after treating more than 2,000 horses since 2003, 65% of race horses with tendon injuries and 71% of race horses with ligament injuries returned to racing after stem cell therapy. The Vet-Stem regenerative cell therapy system uses an animal’s natural healing cells from fat tissue, which are capable of differentiating into a variety of tissue types including tendon, ligament, bone, cartilage, and muscles, and have been proven to reduce pain and inflammation. It seemed prudent at JOP to let readers know what is coming down the pike in the Prolotherapy world. 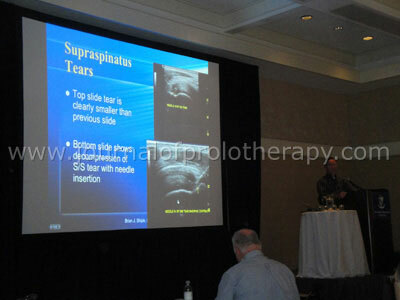 John Sessions, DO, demonstrating cervical Prolotherapy with pumice at the AOAPIPM April conference in Naples, Florida. In addition to Stem Cell Prolotherapy, a hot topic which was discussed at the AOAPIPM meeting and the American Association of Orthopaedic Medicine (AAOM) held April 27-30, 2011 in Las Vegas, was the use of musculoskeletal ultrasound in diagnosing and treating painful conditions. As the sensitivity of the machines improve, ultrasound is not only helping with diagnosing, but also proving what Prolotherapy doctors have known all along… that Prolotherapy does indeed stimulate the repair of injured tissues. This question, however, remains, “Does the added cost of using ultrasound guidance, lipoaspirate, bone marrow, or PRP, really aid the efficacy of the treatment to actually benefit the individual customer?” There are some Prolotherapy doctors who use PRP on almost every patient and others who do an ultrasound examination as part of the routine analysis of a patient. Perhaps some day this will be the norm, but is this in the average patient’s best interest? With every technology comes a cost. In some patients, surely technology will save money because perhaps the ultrasound will show a large effusion that can easily be drained. Then the patient’s care would have been completed, versus getting a lot of physical therapy or other therapy that has no hope of resolving the effusion. But for others, the technology may just be another cost in an overly costly system. Most “old-time” Prolotherapy doctors use history and physical examination, and simple Prolotherapy solutions and appear to get great results. For some complex cases, possibly ultrasound analysis and directed treatment with or without PRP or Stem Cell Prolotherapy could be used for the most prudent care. Some Stem Cell Prolotherapy treatments cost thousands of dollars per treatments, whereas normal dextrose Prolotherapy sessions run a few hundred dollars. Time will tell which type of Prolotherapy solution is best for which particular case. Like all newer therapies, there will be a place for it, but it will be a few years, at least, to show what and where that place is exactly. Gerald Harris, DO, Marion Hauser, MS, RD and Donna Alderman, DO, taking a break from the AOAPIPM conference. Christopher Davis, DO, Program Chairman, talking on musculoskeletal ultrasound in diagnosis and treatment of the shoulder. 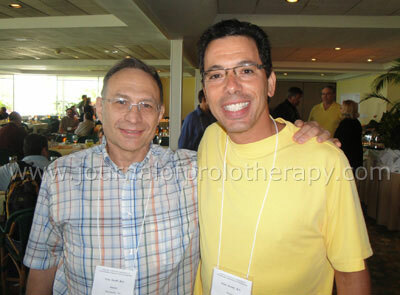 Clive Sinoff, MD and Ross Hauser, MD enjoying the AOAPIPM conference. The Las Vegas AAOM conference entitled Regenerative Orthopaedic Medicine Applications Through the Lifespan also discussed these issues including Stem Cell Prolotherapy and the use of ultrasound for the practicing pain specialist. One of the pre-conference workshops included a day of training on Neural Prolotherapy with Dr. John Lyftogt from New Zealand. His thoughts are that many patients with chronic pain have neurogenic inflammation in the peptidergic sensory nerves that resolve with 6 to 8 treatments of 5% dextrose. His explanations could indeed change the face of pain management throughout the world. I hope JOP and others will continue to support Dr. Lyftogt in his efforts. Another of the many highlights of the conference included a Prolotherapy research lecture from Dr. K. Dean Reeves, who, besides helping Dr. Lyftogt in his work, is involved in research with Dr. Gaston Topol of Argentina. They presented a double-blind placebo controlled study involving dextrose Prolotherapy for Osgood-Schlatter disease. This study, along with a double-blind placebo controlled study at the University of Wisconsin (Drs. Rabago and Patterson) which also involved dextrose Prolotherapy, showed statistically significant improvement with dextrose Prolotherapy. AAOM course coordinator, Brad Fullerton, MD, summarized the research stating that dextrose Prolotherapy, versus all the other forms of Prolotherapy (including PRP and stem cell), has the most amount of evidence to support it. TheJournal of Prolotherapy congratulates the staff of AAOM and AOAPIPM for putting on very informative, comprehensive conferences. 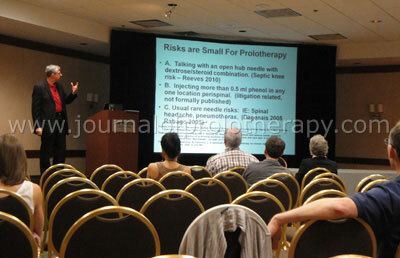 K. Dean Reeves, MD lecturing on Prolotherapy research at the AAOM conference in Las Vegas, NV. 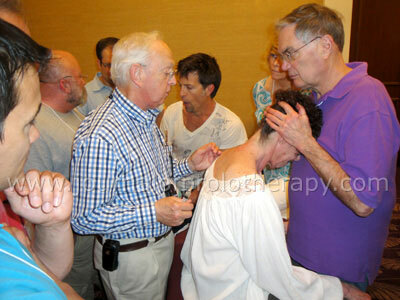 John Lyftogt, MD demonstrating his Neurofascial Prolotherapy technique at the AAOM conference in Las Vegas, NV. Prolotherapy, like all medical sciences, needs innovators to allow new avenues of natural healing to be developed. One of the main goals of the Journal of Prolotherapy is to provide a platform for these doctors, such as those pushing forward with Stem Cell Prolotherapy, to make their research known. In addition to the stem cell features in this issue, we are again grateful to Dr. Gary Clark for his seminal four-part series, which concludes in this issue with: Diagnosing Linked Prolotherapy Targets by Applying a Data-based Biotensegrity model. While documenting results of a therapy is important for its acceptance into mainstream medicine, equally important is good treatment technique. Dr. Rodney Van Pelt shows us his technique for treating ischial tuberosity pain with Prolotherapy. Lastly, looking at a patient’s nutritional status is often necessary for helping a patient heal. To speak to the nutritional factors involved in healing, Dr. Margaret Thomas has written an article sharing her experience and recommendations. As you may have already learned, the Journal of Prolotherapy is going all electronic in 2012. We have started to put some material online only. For this issue, we have included online content from Clive Sinoff, MD and Joern Funck, MD. I encourage you to check it out, and thank you for your support as we evolve into our new electronic format over the coming months. Babcock P, et al. Webster’s Third New International Dictionary. Springfield, MA. G.& C. Merriam Co, 1971, p. 1815.